The construction of the Delaware Railroad in the 1850s led to the establishment of the Delmarva Peninsula’s first and most important north-south railway transportation artery. Proximity to the nearby community of Camden resulted in the location of a station here when the railroad arrived in 1856. Settlement of “West Camden” quickly expanded with the construction of homes and businesses. In 1865 the Rev. John J. Pearce migrated here from the Wyoming Valley in Pennsylvania. Rev. Pearce purchased lands and subdivided them into building lots. Other residents of Wyoming Valley followed Rev. Pearce and settled in and around the thriving village. Desiring to sever any shared identity or connection with Camden, residents chose to honor the new citizens by changing the name of the community to Wyoming. 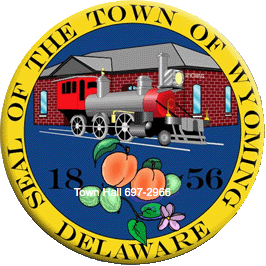 A post office was established in 1866 and in 1869 the Town of Wyoming was incorporated by the Delaware General Assembly. Surrounded by some of the state’s most productive farmlands, the Town of Wyoming was a major point for the shipping of peaches and other agricultural products.